I drove the short distance to the hamburger joint, the epitome of laziness. As I drove up, I saw the same couple, in the same scenario as the day before. The woman was marooned in the middle of a moderately busy street waiting to cross, the man and dog had already crossed. I waited a moment and the cross traffic soon stopped to let the woman pass. Recognizing them from yesterday, I hurried to park my car while keeping my eyes on their path. A few moments later, I caught up to them at a nearby crosswalk. I've given money to homeless people before. I have a procedure I follow for my own safety. Remove your money from your wallet first, just in case things go badly this reduces the chances of your wallet being stolen. I switched the cash from my left hand to my right hand so that I would not accidentally flash the very expensive watch I was wearing. Once I had taken precautions for my own safety, I approached them. The man was closer to me so I approached him. As he looked at me I could see that he was blind in one eye. His dog was cute, and looked well cared for, all things considered. The woman had a weathered face and a small frame. When I spoke to them, I said that I had seen them yesterday, and that I figured I knew their situation. I made the assumption they are homeless, and that they had spent the night somewhere nearby, probably outside. It was a little tricky to go off this assumption without insulting them, or shaming them into repeating it. The conversation was not long. Once I stated why I was there, I said I wanted to help them. Fifteen dollars is all the cash I had on me, and I gave it to them. They both said "God bless you" and I wished them the same. I then turned around and went to get my hamburger. It's probably a sign of trauma, but one of my earliest memories was of a recurring nightmare in which I was a homeless adult. To this day, I recall waking up horrified and sad from that nightmare. 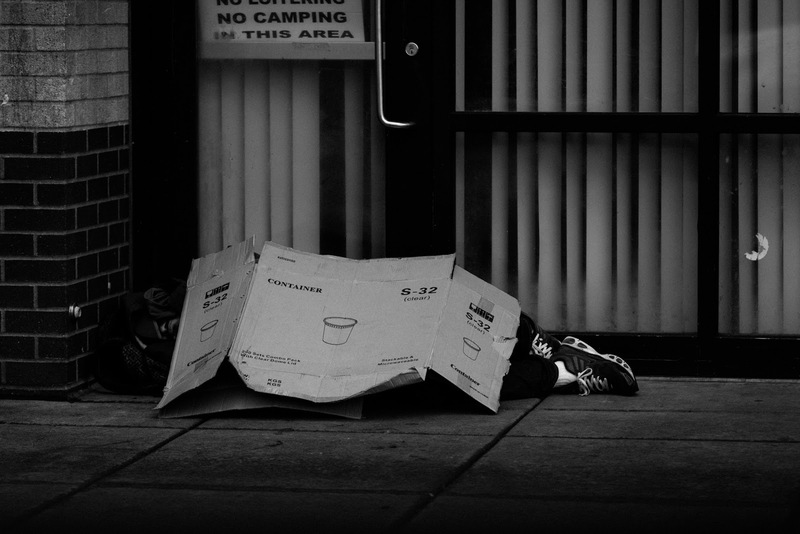 As I grew older, I always held a special place in my heart for the homeless. Due to economic reasons, the working poor are probably worse off than the homeless, I am aware of this. Nobody sees someone working multiple jobs to pay the rent and stops to offer them cash. Poverty is the biggest problem we face, because so many other problems are born in poverty. It is very sad poverty exists, and a lot more could be done to prevent it. Yet we often don't know where to start. How to make things better for those in poverty without becoming a nanny-state? The homeless are unique in that they are the face of poverty that people would prefer to never see. The working poor allow people to be complacent and assume "the system works" and if they just keep plugging away at their jobs sooner or later things will work out for them...somehow. But the working poor are often hard to distinguish. The homeless take poverty and shove it right in people's faces, which is the only power they have. Sadly, I know people who have a lot of contempt for the homeless. They seem to think of homelessness as some kind of paradise. No pressure from their job, free from expectations, coasting along just fine on handouts while being drunk or high all day is what homelessness is to them. I try to show these people that many homeless people are mentally ill or suffer from addiction issues, or both. Those with contempt for the homeless don't like being reminded of the immense suffering inherent in being homeless, so they pretend being homeless is a party, to justify their contempt to themselves. Years ago, I was in a bad marriage to an alcoholic. That marriage obviously had to end, for the sake of each of us. I kept in contact with my ex after we split because I really hoped that she would pull out of the throes of alcoholism. Fear was really a big motivator, because suddenly my fear of homelessness from early childhood was being amplified. In many ways, that relationship resembled my recurring nightmare from childhood. I was truly concerned that my ex-wife would be homeless, and soon. She tried to get help but nothing was working and she continued her downward spiral. The situation with my ex-wife came to a head one fall morning. My phone rang from a number I did not recognize, so I let it go to voicemail. When they called back moments later, I answered it. As soon as the caller said they were from the coroner's office, my heart sank and my life changed forever. My ex-wife had passed away from alcohol poisoning. It's a bittersweet thankfulness for me that she never had to be homeless. Those who don't die from their addiction troubles often are. I want to help the homeless, but I feel powerless in many ways. Who's to say the couple didn't take the money I gave them and squander it on a vice? I wished I could have taken them to a nearby supermarket and bought them what they needed to get on their way. My lunch hour is only one hour though. Plus, this couple may need more than what a supermarket could provide, like transportation, medical treatment, a mailing address, and a bank account. As I ate my hamburger, I felt a lot less jubilant than I had just a few minutes prior. My excitement about my success at my job had pretty much evaporated. If this was all an attempt to make me feel better about myself, it didn't work. For being homeless, they seemed to be pretty orderly. Maybe they were just in a rough spot on their way to their next destination. I hope my fifteen dollars helps get them to where they're going, but I don't know if that is up or down. I don't know why the memory of my ex-wife still haunts me when I see a homeless person. I don't know when that will go away, or if it ever will. I don't know why one of my earliest memories is of a recurring nightmare centered around homelessness. I don't know what I can do to truly help the homeless because every time I give them money it feels like a stopgap, at best. Most importantly, I don't know how to stop poverty. Many people don't know the answer which is why it persists. I returned to my job troubled by all the things I don't know.